I got The Lord of the Sands of Time at around the same time as All You Need is Kill, when I was really heavily into my anime. This one has been less widely publicised in the meantime, so I had very little impression of what it would be like, as compared to the latter novel which has the Americanised film version that I still cringe at the thought of. I remembered trying to read it when I first got it, but that first impression has been long lost in my memory. So, an essentially blind read, how did it fare? 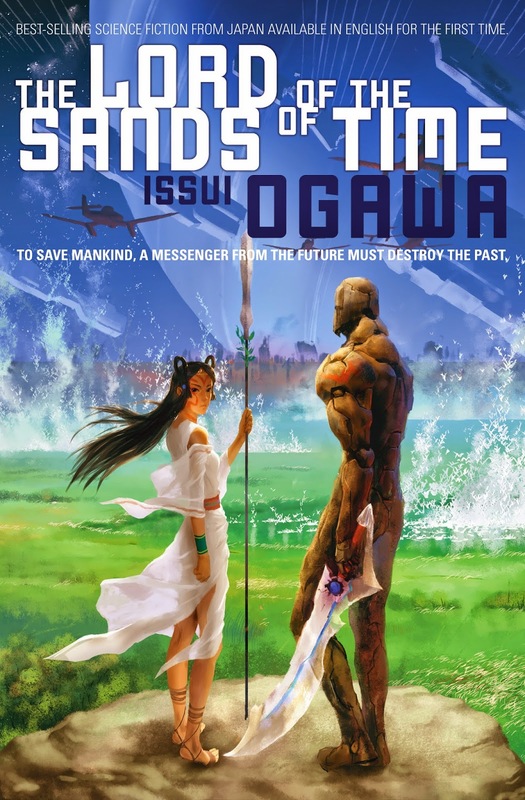 The Lord of the Sands of Time follows Messenger O, a cyborg that has been sent into the past following a devastating alien attack that has annihilated all life on Earth. The last pockets of mankind that is left on the off-planet settlements give him the mission of going to a time where the aliens have not reached Earth yet and unite humanity in an attempt to stop the alien invasion before it has a chance to begin properly. In doing so, O must face up to not only leaving behind the woman that he loves, but potentially erasing her from time entirely. This is a simple enough novel to read if you're familiar with time travel in science fiction. The chapters alternate between Messenger O's battles in the Iron Age era of Japan and the other eras that he has previously fought in, with each era reaching back further and further into the past. The year and location of each chapter is clearly stated at the beginning of each chapter, so it's easy enough to keep everything organised as the plot progresses, and yet it also boasts some of the more in-depth looks at time travel problems that usually crop up within this genre. In particular, I liked the fact that the numbers of cyborgs who can fight this threat is constantly changing due to the changes that they make to the timestream that they currently inhabit. When they interfere, certain events happen differently, meaning that different individuals live and die; sometimes an ancestor of some of the cyborgs' creators will die and thus erase the circumstances of their creation, while at other times new cyborgs will be sent back as creations of people whose ancestors had previously never lived to reproduce. It's an interesting dynamic that I haven't ever seen happen in a time travel story before. Additionally, it's nice to see the whole "history repeating itself" thing come up. I hadn't really considered it before, but it really makes sense that the Messengers end up having to travel back so far in time, because in all of the modern eras, humanity essentially dooms itself because of the far-reaching conflicts and endless amounts of red tape that can be thrown down as a barrier to progress. It was an interesting, if somewhat alarming, assessment of our current ability to actually unite effectively against an aggressive outside threat. The one thing that did sit weirdly with me was the ending. The threat keeps mounting in the fight in Japan, until all seems utterly hopeless, only for things to basically come to a stop. I had hoped for a more definite resolution, but instead it just runs out of steam and settles for a stopping point. Disappointing, but far from a game-changer.